Wow, we are finally at the conclusion of the 6 part series about Maximizing Your LGBT Outreach with a Solid Plan. I have enjoyed covering the 5 parts of creating an effective plan with you. From determining who you are marketing to, to figuring out how you are better than the competition to showing you where to start the actual outreach. 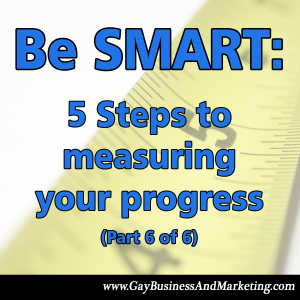 Last week we talked about the foundation of relationship building and now we are going to talk about how to be SMART in measuring your progress. There’s no sense in having a plan if you aren’t going to measure and track it! Throughout this series we’ve talked about planning, having a vision and a mission but now this is where the rubber meets the road. We need to make sure you have S.M.A.R.T. goals in place to maximize your success. Your goals must be Specific, Measurable, Attainable, Realistic and Timely. Think of a sporting event like football. You have two teams with one common objective – to beat the other team. Each team has different people, different coaches, different strategies and a recipe for success to win. What they also have in common is that they are SMART about the end results they are looking for. If they weren’t smart and strategic, why would they even be on the field trying? It would be like playing the other team blindfolded. It’s the same thing in your business. Are your goals designed blindfolded? Or do you have a clearly defined objective at hand? Maybe you have an end goal in mind and a clearly defined objective, but are they SMART? Let’s run through an example together. Let’s analyze how SMART this goal is. Is this goal (M)easurable? Yes, it’s absolutely measurable. The goal is 100 business owners. That is something that can be tracked and measured. If we went back to the orignal statement of “My goal is to increase registrations for my training course,” then it would not have been measurable. The word increase is relative. Is this goal (A)ttainable? Only you will know the answer to this question. Are you shooting for the moon with absolutely no idea how you will get there? Make your goal attainable. You can always change your goal later and bump it up if you’ve hit your targets. I’m not suggesting that you don’t make your goals lofty. I am all about making a goal something you need to reach for, what fun would it be if they weren’t, right? Is this goal (R)ealistic? Realistic in this case really means is this doable? Is this goal something you are capable of doing? Is the learning curve on this project straight up or is it a gradual incline you can handle? In the example above, the goal is to get 100 business owners to register for the training course. Would it be realistic if my goal were to get 1,000 people to register? Would this be something I could do. While it may be doable, it wouldn’t be a realistic goal. Would I be capable of serving the needs of 1,000 people at this very moment, probably not. Could I pull it off, yes, but would I want to, no. You need to be realistic with yourself and your clients. Is this goal (T)imely? Do you have a time frame built around your goal? Having a time frame gives you a goal to strive towards. Without a time frame what’s the motivation for putting some pep in your step? What’s your built-in incentive? Without time limits there isn’t much urgency to get the job at hand done. In the example above, the goal has a specific time frame attached to it. I didn’t just say the summer, I specified June-August, so three specific summer months. I would suggest running through this exercise with the goals that are related to your LGBT outreach plan. By the end of the exercise you will have SMART goals which will make it easier for you and your team to execute on. I hope you’ve enjoyed this 6 part series and were able to implement and execute on what we talked about. I love to hear success stories so if this was of value to you and you are having success with it, let me know. I’d love to highlight it in an upcoming podcast. For more information you can tune into the next free webinar and ask questions during the live Q&A. Part 4 of 6: Where do I begin my LGBT outreach efforts? Do you know someone who could use this advice? If you liked what you read here, I encourage you to Like it on Facebook, Tweet it to your followers or post it on LinkedIn. All can be done with a simple click below. Thanks!